Everything seemed to take much longer than anticipated. Before long it was 11.45am, I was watching two ovens, trying to put a smoked fish starter plate together (hadn’t taken that one into account, had I!) with one hand while whisking the living daylights out of my Béarnaise with the other. My partner and half the kitchen had already cooked their steaks and, if there’s one thing that makes you feel really behind with things, it’s when the kitchen empties around you while you’re still struggling. I finally managed to get everything done and tasted – the steak was grand, not brilliant, but I was well beyond caring at that stage – and then I discovered our large saucepan was missing. Every day all the items that are supposed to live in each colour-coded section are checked by the teachers and missing things are the bane of our lives. By the time I had traipsed around the other three kitchens (still no sign) and got the ok to leave, lunch was almost cleared away and I was in a right grump. Sitting with the few that were still lingering over lunch, it seemed that few people had an easy morning. These crises of confidence – I can’t cook, I’m totally disorganised, what on earth am I doing here? – are something that hit us all at different stages, especially when you’ve left your job to do this course! Then it’s good to take a step back, grab a cup of coffee to drink somewhere quiet and calm outside and have some quality chill-out time watching the chickens scratch for beetles under the moss on the steps. Hi Siobhan…best send me an email via c_hennessy@yahoo.com as my cook@bibliocook is being spammed to the max at the moment. This dark and cold weather has slowed everybody up. To be honest, we’ve been pretty lucky with the weather here all through the course – the evenings are dark at this stage but the mornings are still gorgeous and it’s great to see the sun rise across Ballycotton bay as I go into school. Think it was just a bad day! Hey, just stumbled across this site. There are some great recipes. I am doing a photography project on food in cork so it is really great to read this. 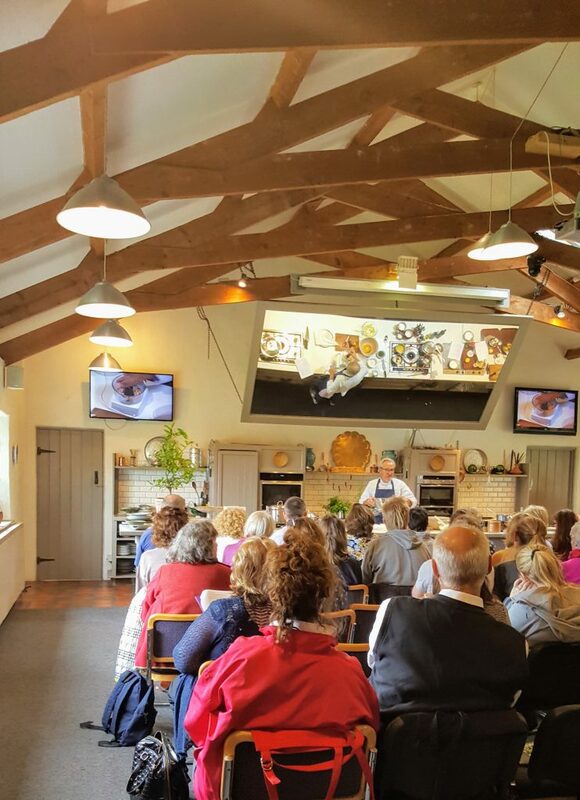 Was down in Ballymaloe house and cookery school 2 weeks ago and it is a lovely place and your really lucky to be doing a course there. Hope it all goes well for you! Thank’s Aibhínn – I’m afraid you won’t find many photos at the moment on the site as, during our last move, the lead to connect the camera to the computer disappeared. Not like I would have had time to actually take or upload pictures anyway! Pity that we didn’t meet up when you were down – were you in for lunch and an afternoon demo? I was there taking photographs so was in the kitchen in Ballymaloe and in and out of the school, was snappng at the back of Rachel’s demonstration on Ice Cream. I was also at the Midleton market recently and took photographs there of the Ballymaloe stall. We’ve done so many ice cream demos at this stage that I can’t remember when that was! When were you at the Middleton market? The day I was working there – with a very red face from the unseasonal heat! there was someone taking photographs of the stall. That wasn’t you, by any chance? Ya its possible, i just looked there and the day you posted the post about the market is a few days after when I was there. It was a very bright sunny day, so chances are it was me.